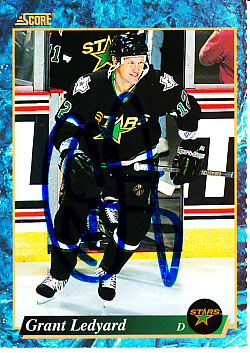 1993-94 Score hockey card autographed in blue marker by former Dallas Stars defenseman Grant Ledyard. Obtained in person. Has perforated edges. With certificate of authenticity from AutographsForSale.com. ONLY ONE AVAILABLE FOR SALE.